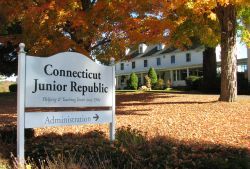 The mission of the Connecticut Junior Republic (CJR) is to provide care, treatment, education and family support for at-risk, special needs and troubled young people so they can become productive and fulfilled members of their communities. CJR believes that if given the opportunity, every young person has the potential to develop the skills, self-discipline and social responsibility necessary for a rewarding and worthwhile life. CJR values every family as a critical partner in the treatment process. The agency believes that whenever possible, it is most desirable to work with young people and their families within their own communities. When out-of-home services are required, the family must be valued and included as an important and equal partner in the treatment process.